Finding a job may be a time and energy-consuming task. Opus is a program written to help people to send their application more easily. It can be used to generate personalized cover letter. I began to write it several years ago and I took the time to enhance it with the aim to help other people. During this experience, I got better at python programming, I learned graphical interfaces with pyQt and how to make a windows self extracting executable. 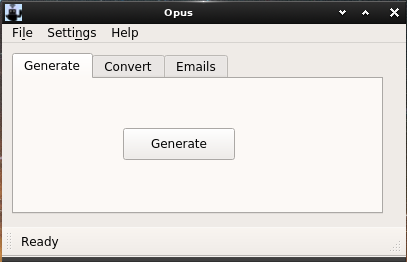 Opus is basically a "mass mailing system" based on templates. The user adapts his cover letter with keywords that are substituted with data coming from an excel file. Opus is still in an early stage. User is responsible of its use and of the messages that are sent. Opus is a opensource software. There is a self extracting executable availaible for windows but it is possible to use it from the sources. Just clone the git repository after installing the dependencies in a python virtualenv. You can test it with its demo data and configure it later (see section getting started). It is also possible to download the sources as a zip file on the repository. TLDR (windows): Download Opus for windows and launch it. See the generated files in directory %temp%\opus\data\sent. Edit %temp%\opus\data\list.example.xlsx, generate the letters and see what happens. Download Opus start pack which contains a sample configuration file and templates. Rename the configuration file to opus.ini and personalize it. (see section Configuration). Launch Opus. Two interfaces are available: CLI (in french) and a GUI. (see Interfaces). I will assume that you use the graphical interface. You can configure Opus by editing the settings. The best idea is to select the configuration file of the Opus start pack and rename the templates. You can link your own templates in the 'file' section. Once you are ready, generate the letters. 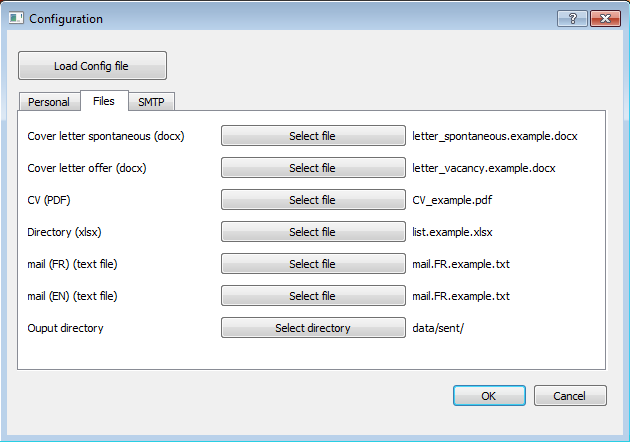 The files are generated in the output directory (see Configuration). Once you have edited the letters and the mails (remove the bold texted that was substituted), you can convert it to PDF. If Libreoffice 5 is installed, Opus can convert all the document at once. if not, you can convert the .docx to PDF with Word. You may now send the mail. A copy is sent to your adress. Once the mails are sent, you must edit the first column of the repository (xlsx file). Only empty first cells allows the generation of the letters.This prevent to sent multiple times the same application. I strongly advise to move the generated documents in another folder. It will help you to keep in mind what you have already sent. I strongly suggest to sent the first letters to your email in order to see what the recruter will get. Two interfaces are available: cli and gui. The launch opus.py with option -i or --interface to select it. By default the graphical interface is chosen. This interace is usefull but it is only avaible in french for now. The ini file has 3 sections. password (clear text in the ini file). sent indicate something if the application must not be sent. For example if you already sent the email to this company. nom: if you sent the application to a person whose name is known. subject: the reference of the offer to put in the subject mail. web, telephone, number, information: complementary useful information. These data are not used yet. OFFER: the reference of the offer. The same fields are usable in the emails. The log is located in %temp%\opus\opus.log on windows (exe file) and in the main directory otherwise. You can contact me, I will try my best to help users. I generated it with cx_Freeze (see setup.py) and 7z SFX Builder. Opus est un programme d'aide à la recherche d'emploi. Il facilite l'envoi de lettres de motivation et CV générés à partir de canevas personnalisés.